Ever since the “War on Drugs” was declared in the 1970s, illicit drug trafficking to North America has exhaustively caught the media’s attention. Researchers have traced the origins of the trade and scrutinized every aspect of the market, ranging from the producers down to the consumers. They have questioned both domestic and international policies meant to regulate the trade and examined the effect of drugs on societies, all while criticizing countries south of the border for their lax governmental institutions. There is no doubt that for many years, drug-related violence has ended up killing thousands of innocent civilians. However, little research exists on the flow of firearms to the south, even though the noxious effects of the trade are equally disastrous, if not more so. Small arms and light weapons range from handguns to man-portable machine guns. They are relatively affordable and easy to handle, making them a practical item suitable for smuggle across borders. Unlike drugs, which are considered illegal almost globally, small arms enjoy the privilege of having a legal market where the public can readily purchase a gun online. Even though a build-up of arms does not necessarily create conflict, the excessive accumulation is cause for alarm. In Central America, there is an evident lack of control over gun ownership, and even legal purchases can cause disconcerting accumulation. For example, Hondurans are allowed to register up to five firearms per person, while Guatemalans have a surplus of 7 guns per soldier. These numbers do not account for all the illegal transfers that are disseminated throughout the region. There are approximately 2.2 million registered firearms in Central America and experts estimate a total of 2.85 million unregistered firearms in the region. The trafficking of small arms is an issue of grave concern to regional specialists, due to the fact that many Central American countries have levels of violence well above the global average. To make matters worse, most of the crimes committed in the region are perpetrated with small arms. In Central America, an average of 77 percent of homicides are conducted with firearms, which is significantly higher than the global average of 42 percent. There is an undeniable relationship between the accumulation of illegal weapons and existing levels of violence, and even though firearms are not the only cause for violence, they are a destructive force that must be studied in depth. Firearms not only fuel violence, but studies also indicate that armed conflicts increase food insecurity. Consequently, armed conflicts can deter development and exacerbate poverty. The availability of illegal small arms places a severe constraint over people’s freedoms, as they are often used for intimidation, especially when they fall in the hands of criminal groups and gangs. For example, the prevalence of guns in Honduras increases the perceived threat of gangs. In many cases, gang members have been known to coerce civilians into paying a ‘war tax’ and for using firearms as a tool for intimidation. If a civilian feels intimidated, he will pay the tax and therefore diminish his income (which can be an average of $170 a month). In addition, violence creates an unstable environment that propels refugees to migrate. Significant portions of firearms in circulation have been available since the advent of Central American civil wars. This includes Guatemala (1960-1996), El Salvador (1980-1992), and Nicaragua (1972-1991). Many of the weapons that circulate today are Cold War era models, and since firearms are highly durable goods, many are still fully functional. For example, in El Salvador, it is estimated that 360,000 military-style weapons were not handed over at the end of the war. In Nicaragua, the U.S.-backed Contras received large quantities of assault rifles, many of which were leaked throughout the countryside after the Nicaraguan military was downsized. Even though the country had one of the most successful weapons destruction programs in the region (destroying over 100,000 arms), there still exists a huge surplus that has diffused across borders. Military and police stockpiles in Honduras, El Salvador, and Guatemala are said to be one of the largest sources of illegal weapons in Central America. In addition, these stockpiles are not highly guarded which increases the possibility of theft and diffusion to criminal groups. Even though military style weapons can date back to the Cold War, most of the police seizures today involve 9mm caliber pistols. Figure 2 and 3 illustrate the most popular pistols found in studies by the ATF. The graphs demonstrate that the weapons of choice are pistols (usually 9mm), followed by revolvers. 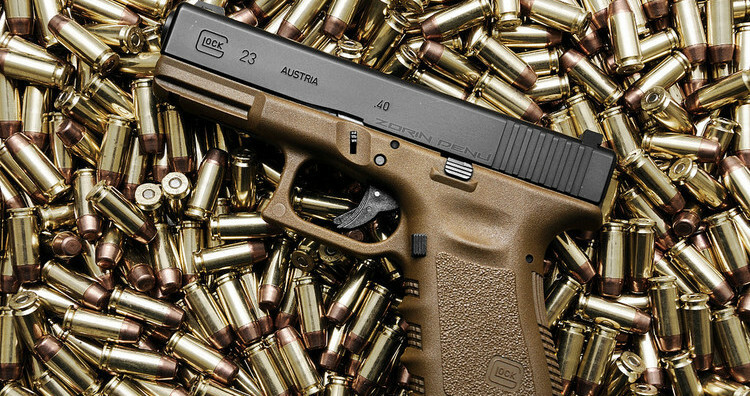 Imported from Georgia, Glock pistols are popular because they are affordable, at $200-$400, and easy to carry. A study conducted by the ATF indicated that guns were also traced to Texas, California, and Florida. Registered arms can be traced easily through electronic tracking mechanisms, but can become illegal through resale or leakage. For example, straw purchasers are buyers who acquire firearms through the legal process with the sole purpose of resale. However, if the straw purchaser lies about the identity of the ultimate possessor, while having prior knowledge of the sale, he can be tried in court. Straw purchasers are a common source for illegal arms in Central America and little is done to prevent resale. In fact, even though straw purchasers are against the law, the ultimate punishment tends to be minimal. When a firearm becomes illegal, it is almost impossible to track and can be subject to mishandling. In many cases, firearms are hidden in vehicles and transported by land. On other occasions, firearms have been found concealed inside checked baggage on commercial flights. The flow of guns follows no specific trail and is not generally conducted by particular individuals. It is difficult to trace illegal sellers because they often conduct the business as a part time job or as a one-time assignment. The exchange of information among countries is essential to facilitate the trace of illegal arms. However, there are very few of these exchanges among Central American nations and the United States. In fact, the U.S. is one of three countries that has not ratified the Inter-American Convention Against Illicit Manufacturing of and Trafficking in Firearms, Ammunition, Explosives, and Other Related Materials (CIFTA), which criminalizes illegal transfers of arms and encourages the exchange of information among its participants. In addition, certain Central American countries have lagged behind in establishing proper policies to prevent the diffusion of arms across borders. ETrace, a tracking system that allows countries to submit trace requests in order to facilitate the analysis of illegal gun traffic, is an effective tool used to track the diffusion of weapons. The Bureau of Alcohol, Tobacco, Firearms, and Explosives (ATF) has established an office in El Salvador to encourage the implementation of eTrace. Since 2013, Guatemala has sent more than 100 trace requests per month to the ATF. Similarly, El Salvador has submitted requests for thousands of firearms. On the other hand, their neighbor, Honduras, has lagged behind. Even though the eTrace system intends to outline the trade, it only offers a small-scale solution. Currently, approximately 16,000 thousand firearms are seized per year in Central America. At the current rate, it would take 188 years to confiscate all the guns that have been sequestered – that is if no more firearms enter the market. Clearly, this is not a feasible solution. The eTrace system is definitely a helpful tool, but if we want to see significant results, demobilization specialists should be trained on a larger scale to be able to submit trace requests. In addition, the ATF is a noticeably underfunded U.S. agency due to gun lobbyists in the United States. Current laws do not require licensed dealers to report sales to authorities and buyers are not usually obliged to register their guns after a purchase. In 2011, the Department of Justice issued a new regulation that required gun dealers in California, Arizona, Texas, and New Mexico to report the sales of more than two semiautomatic rifles to one person in a period of five days. However, the regulation simply shifted sales to other states. The existing regulations on arms control are limited and often unsuccessful. Since many firearms have now attained illegal status and are difficult to locate, an alternative is to place stricter rules on ammunition and thus be able to trace the flow of weapons. Firearms do not function without ammunition so by tracking the sales of bullets, authorities would have a better idea of the location of specific arms. Though the U.S. is not the only supplier of arms, it is one of the largest contributors to the market. In order to prevent the diffusion of weapons, it is essential for Central American countries to place stricter rules on the sale of arms within targeted countries and toughen their external borders. Regional cooperation and a free exchange of information are necessary elements to prevent the illegal sale of arms. Many Central American countries have already ratified treaties that prevent the diffusion of weapons and encourage the exchange of information, such as the 2001 United Nations Protocol against the Illicit Manufacturing of and Trafficking in Firearms, Their Parts and Components and Ammunition. However, these treaties have not sufficiently addressed the issue, since the diffusion of weapons is still a prevailing problem. Today, people recognize the detrimental effects of the drug trade flowing north. The U.S. media is focused on issues that affect the domestic circumstances – illegal immigration being an example. However, they often fail to perceive the adverse effects that a legal arms market has on the rest of the hemisphere. The flow of arms is derived from the northern countries that have the privilege of a legal market to sell weapons. The danger occurs when these arms are resold or stolen, therefore becoming illegal and difficult to track. Small arms are not the only cause for violence, but they do play a significant role in its perpetuation. In order to combat the issues that are affecting regional stability and strengthen U.S.-Latin American relations, both the authorities and the citizenry of the region ought to cooperate with each other. Washington must recognize the dangers of small arms accumulation and realize that the threat is a transnational issue that disseminates across borders. Klare, Michael, and David Andersen. “A Scourge of Guns: The Diffusion of Small Arms and Light Weapons in Latin America.” Federation of American Scientists. January 1, 1996. http://fas.org/asmp/library/scourge/Titlepg.pdf. Graham, Ronan. “Honduras Guns Feeding Central America’s Arms Trade.” InSight Crime. August 12, 2011. 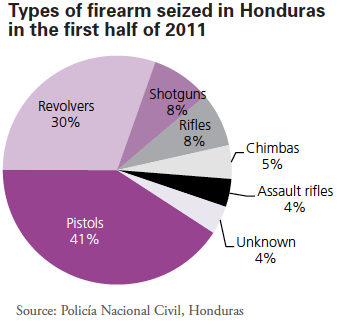 Accessed September 6, 2014. http://www.insightcrime.org/news-analysis/honduras-guns-feeding-central-americas-arms-trade. Wells, Miriam. “Report Traces Arms Trafficking from US to Guatemala.” InSight Crime. May 8, 2013. 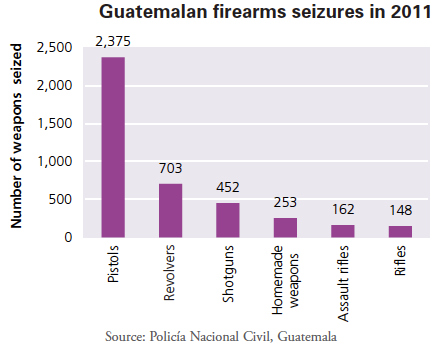 Accessed September 5, 2014. http://www.insightcrime.org/news-analysis/guatemala-arms-trafficking. “Firearms within Central America.” United Nations Office on Drugs and Crime. http://www.unodc.org/documents/toc/Reports/TOCTASouthAmerica/English/TOCTA_CACaribb_firearmssmuggling_within_CAmerica.pdf. Ibid. 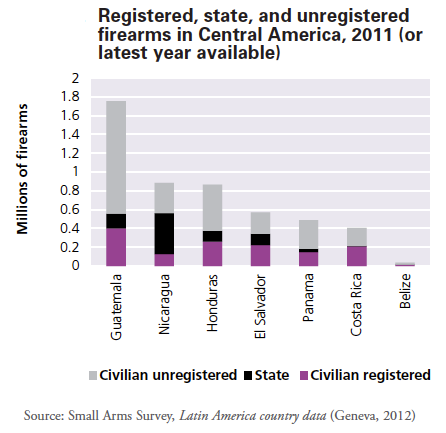 “A Fatal Relationship – Guns and Deaths in Latin America and the Caribbean.” Small Arms Survey. January 1, 2012. Accessed September 7, 2014. http://www.smallarmssurvey.org/fileadmin/docs/A-Yearbook/2012/eng/Small-Arms-Survey-2012-Chapter-01-EN.pdf. “Small Arms and Light Weapons.” United Nations Office for Disarmament Affairs. Accessed September 7, 2014. http://www.un.org/disarmament/convarms/salw/. Goehsing, Julia. “A Multi-Pronged Approach to Transnational Criminal Networks: The Case of Latin America and the Caribbean.” Centro De Estudios Y Programas Interamericanos. March 1, 2011. Accessed September 6, 2014. http://interamericanos.itam.mx/working_papers/11GOEHSING.pdf. ”Firearms within Central America.” United Nations Office on Drugs and Crime. http://www.unodc.org/documents/toc/Reports/TOCTASouthAmerica/English/TOCTA_CACaribb_firearmssmuggling_within_CAmerica.pdf. Ibid. Ibid. Goodman, Colby. “U.S. Firearms Trafficking to Guatemala and Mexico.” Wilson Center. April 1, 2013. Accessed September 6, 2014. http://www.wilsoncenter.org/sites/default/files/Goodman_Firearms Trafficking to Guatemala and Mexico_Working Paper_0.pdf. MacGillis, Alec. “America’s Wild-West Gun Laws Are Helping Fuel the Border Crisis.” New Republic. July 20, 2014. Accessed September 8, 2014. http://www.newrepublic.com/article/118759/nra-and-gun-trafficking-are-adding-fuel-border-migrant-crisis. Sweig, Julia. “A Strategy to Reduce Gun Trafficking and Violence in the Americas.” Council on Foreign Relations. July 1, 2013. Accessed September 10, 2014. http://www.cfr.org/arms-industries-and-trade/strategy-reduce-gun-trafficking-violence-americas/p31155. “Bureau of Alcohol, Tobacco, Firearms and Explosives.” Bureau of Alcohol, Tobacco, Firearms and Explosives (ATF). May 1, 2014. Accessed September 8, 2014. https://www.atf.gov/publications/factsheets/factsheet-etrace.html. Goodman, Colby. “Neighbors in Arms.” Foreign Policy. May 3, 2013. Accessed September 7, 2014. http://www.foreignpolicy.com/articles/2013/05/03/neighbors_in_arms_us_central_american_weapons. “Firearms within Central America.” United Nations Office on Drugs and Crime. http://www.unodc.org/documents/toc/Reports/TOCTASouthAmerica/English/TOCTA_CACaribb_firearmssmuggling_within_CAmerica.pdf. Sweig, Julia. “A Strategy to Reduce Gun Trafficking and Violence in the Americas.” Council on Foreign Relations. July 1, 2013. Accessed September 10, 2014. http://www.cfr.org/arms-industries-and-trade/strategy-reduce-gun-trafficking-violence-americas/p31155.